Many countries are facing the consequences of widening inequality, which has become particularly acute since the global financial crisis—and evidence is growing that social inclusion and growth in GDP per capita go hand in hand. There has consequently been much discussion about the need to ensure that growth translates into broad-based improvements in living standards that touch all citizens rather than a fortunate few. Yet there is little practical guidance about how countries can achieve both growth and equity. 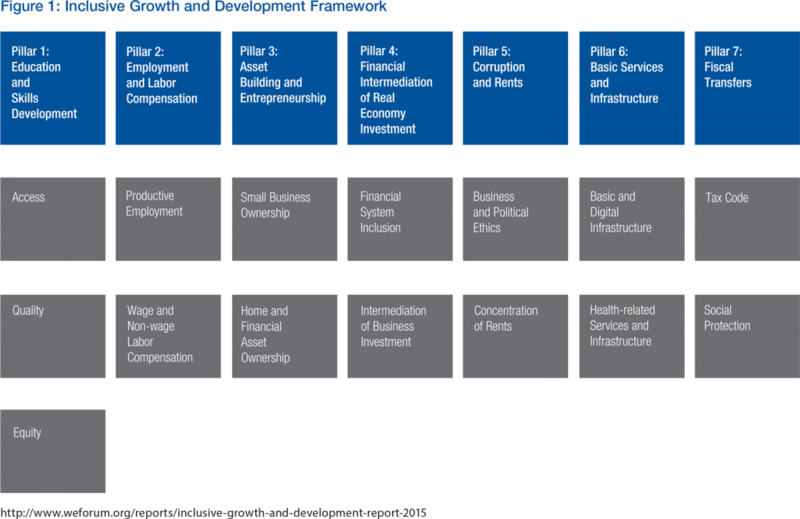 To help fill this gap, the World Economic Forum recently released the inaugural Inclusive Growth and Development Report, which aims to identify countries’ structural and institutional features that influence the extent to which growth translates into broad-based progress in living standards. It presents a framework and a corresponding set of indicators in seven principal policy domains (pillars) and 15 subdomains (subpillars) (Figure 1). A broad spectrum of actions can foster inclusive growth. Six of the seven pillars in the framework focus on how inclusive outcomes can be delivered by market activity rather than subsequent transfers, a factor that is captured by the seventh pillar. This reflects the fact that most households rely on income from wages, self-employment, or small business ownership; therefore it is necessary for an inclusive growth strategy to reinforce—or at least not undermine—incentives to work, save, and invest. Although there is a place for fiscal transfers to address inequality, the inclusiveness of a society’s growth should be measured primarily by the extent to which it produces broad gains in living standards before fiscal transfers are taken into account. First, all countries have room for improvement. There is considerable diversity in performance not only across but also within countries. No country scores above average for its peer group in all 15 subpillars, and only a few come close. Second, it is possible to be pro-equity and pro-growth at the same time. This is demonstrated by the fact that several of the strongest performers in the Forum’s Global Competitiveness Index (GCI) are also relatively inclusive. Third, fiscal transfers can be helpful—but so can other policies. Many economies with high levels of tax and redistribution are highly competitive. However, greater use of the policy space in other areas could reduce the need for these levers. Fourth, lower-income status is no bar to success. In many subpillars—such as Business and Political Ethics, Financial System Inclusion, and Educational Quality and Equity—some developing countries outperform others with much higher incomes. Fifth, there are significant regional similarities. This suggests the strength of the role of shared culture, historical traditions, and political-economy reflexes in areas such as tax systems in Eastern Europe and educational inequity in Latin America. Finally, the current debate on inequality needs to be widened. The debate now typically focuses on redistribution and the upskilling of labor, but these are only a minority of the policy options available to “structurally adjust” an economy for inclusive growth. Looking ahead, the Forum intends the framework and cross-country benchmarking data presented in The Inclusive Growth and Development Report to stimulate discussion not only about policy options in individual countries but also about the most meaningful ways to measure the enabling environment for inclusive growth and development. Research will continue to refine conceptual links as well as methodology, and will include investigating the relative significance of and relationships between the pillars, subpillars, and individual indicators. Last but not least, identifying appropriate data to measure the concepts of inclusion and equity remains a key concern.